Clean sands taken from the Trabzon, Sinop, Zonguldak and Çine regions of Turkey were used in this study. They were named, in order, Type 1, Type 5, Type 9, and Type 13. The samples were obtained by washing four sands through a no. 200 sieve. Type 1 is composed of 53% augite, and its specific gravity is 3.44. Type 5 is composed of 57% SiO2, and its specific gravity is 2.74. Type 9 is composed of 80% SiO2, and its specific gravity is 2.75. Type 13 is composed of 48% SiO2, and its specific gravity is 2.75. Changes in mineral proportions were observed before and after washing of the sand. 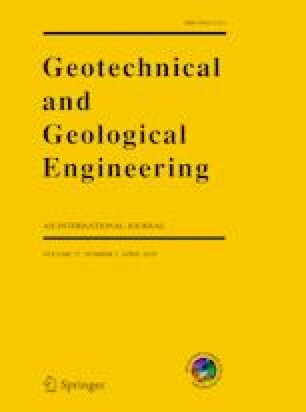 In this research, the procedures outlined in ASTM Standards D4254 and D4253 and the Kolbuszewski (in: Proceedings of the 2nd international conference in soil mechanics and foundation engineering, Rotterdam, vol 1, pp 158–165, 1948) method were used to determine maximum and minimum void ratios (emax and emin). In the study, the linear relationship between emax and emin was investigated, and an attempt was made to determine how much the grain shapes affected the linearity. For that purpose, the effects of emax and emin values on physical, mineralogical, and provenance location of the sand were examined, and various graphics were produced. R2 values were calculated to examine the linearity of the distribution within each sand type. While Type 1 and Type 13 were close to each other in line, Type 5 and Type 9 gave values distant from linear. This study was conducted under the METU-DOSAP program without any additional project support. The study was undertaken by the technical facilities of the METU Civil Engineering Geotechnical Laboratory. I would like to extend my gratitude to Prof. Dr. Kemal Önder Çetin for accepting me as a researcher and for allowing me to benefit from his knowledge and his technical facilities.